How many sun-like stars in the Milky Way? The optimum distance from the star where life can develop on the surface of a planet at a reasonable pace lies in a region called the life-zone. Scientists have given other names: the comfort zone, the green belt or the Goldilocks Zone (since it is neither too hot nor too cold but "just right"). For the more techno buffs, the proper technical name is now called the habitable zone (or HF for short). the region where an Earth-like planet can maintain liquid water on its surface. Whatever definition you choose, there is no doubt liquid water must be the deciding factor when determining a suitable habitable zone so long as life is carbon-based and must evolve rapidly enough. The planetary habitable zone (PHZ). The stellar, or circumstellar habitable zone (CHZ). The galactic habitable zone (GHZ). The diagram is a little misleading in the sense that it suggests all stars are capable of supporting not only continuously habitable planets, but also intelligent life. In truth, a star will expand and contract over its lifespan, causing the CHZ to change. Should the CHZ change too quickly, there may not be enough time for advanced intelligent life to develop (i.e. either getting too hot or too cold on the planet). Then we have the issue of planetary habitability. For example, lying in the colder regions just outside the CHZ could harbor complex lifeforms on its surface. All it needs is the presence of adequate levels of carbon dioxide and other greenhouse gases such as methane in the atmosphere to help trap the heat from a distant parent-star on the surface of a planet. The work into planetary habitability in terms of a suitable atmosphere to support life and maintain adequate heat has been thoroughly covered by world leading expert in the field, Dr James F. Kasting. However, when it comes to stellar habitability, scientists would prefer to choose stars where the life zone is wide enough to permit at least one planet to harbour life and the zone won't change very much for a long enough period of time in order for intelligent technological life to arise. Since it is known by astronomers that stars can have a lifespan ranging from 500,000 years to over 56,000 million years, there is a group of stars scientists consider to be the safest bet of finding intelligent and highly advanced life. The great "campfires" of the universe known as stars are born from nebulae peppered lavishly throughout the cold darkness of space. Our star-studded galaxy contains objects that range from very luminous red and blue-supergiants, through middle-sized yellowish suns, down to dim red dwarfs. Of all the stars, which are the most suitable for the evolution of life? Stars that have one-tenth the mass of our Sun, known as Red Dwarfs, have an estimated stellar lifespan of at least 100,000 million years. On Earth, the chemical and evolutionary path from simple organic molecules in the oceans to exquisitely intelligent lifeforms on land has taken a little over 4,500 million years, so red dwarfs have a sufficient lifespan. In addition, red dwarfs emit mostly the more tolerable and innocuous long-wavelength radiation such as infra-red and radio waves. However, to receive the right amount of warmth and light from these stars, the life-bearing planets lying in the life-zone must be huddled close to the red dwarf. 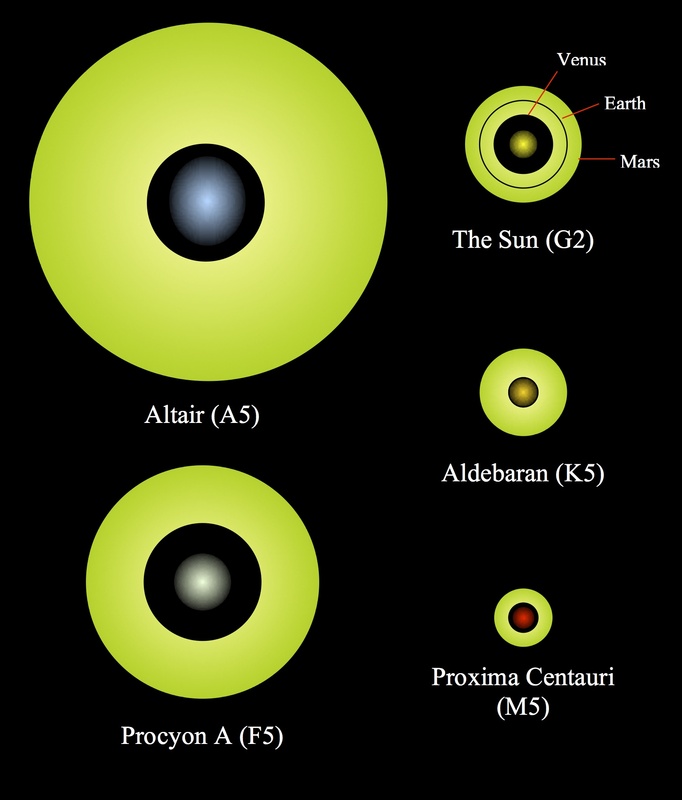 And even if planets could be positioned close to a red dwarf, they must remain in highly stable orbits (since the life-zone will be very narrow indeed) with eccentricities of almost zero to keep them at fixed distances from the red dwarf for thousands of millions of years, otherwise surface temperatures will fluctuate considerably. And this does not take into account the serious problem that these stars may undergo regular flare-ups, causing surface temperatures on a neighbouring planet to vary enormously. Finding alien lifeforms native to these star systems is highly unlikely. At the other extreme, giant and supergiant stars with masses exceeding that of our Sun by 25 percent or more provide copious amounts of visible light, but their great stellar mass reduces their lifespan to well under a few thousand million years. For instance, those stars with a mass of 1.5 times that of our Sun emit a generous 5 times the Sun's visible light. However, they remain stable and unchanging for only 1,800 million years before things begin to get seriously out of hand. When considering the time taken for humans to evolve on the Earth, and assuming this to be a typical evolutionary time span for other life-bearing worlds, a few million, or even a few thousand million years may not be enough for the evolution of highly complex living creatures. In any case, giants and supergiants radiate excessive amounts of ultraviolet radiation within a short period after commencement of their natural fusion reactors (under 4,000 million years), which could prevent the establishment of life on dry land unless caves are present to provide adequate shelter from the radiation. Thus the answer is yes, life could establish on one or more planets because of the large life-zone created around a supergiant star. But for intelligent, technological life to evolve, it is very unlikely that it would happen due to the insufficient amount of time provided by the star. This leaves us with medium-sized stars very much like our own Sun as the best candidates for finding intelligent extraterrestrial life. Although no more than 10 percent of all stars fall in this category, of which approximately 25 percent are single stars, just in our galaxy alone the number of these cousins to the Sun sauntering about is estimated to be in the tens of millions. As for finding technologically-advanced ETs living natively near a Sun-like star, there is a further condition scientists would like to impose on these stars. You see, every civilization developing a technology would require at some point in time the use of iron and later titanium and other metals to build extremely strong and lightweight transportation vehicles and powerful electronic devices such as computers and radio telescopes. With this in mind, scientists now believe virtually all sun-like stars like our own should contain adequate levels of metals such as iron in its chemical composition to help increase the chances of finding unseen metal-rich rocky planets nearby and so allow ETs to develop a technology on the planetary surface given adequate time. Two or more stars moving through space at a sufficiently close distance from each other may find themselves gravitationally held together in perpetual orbital motion, while a large unstable star can split into two smaller closely-spaced luminous balls of hot gases. From this fact, we can understand why scientists believe multiple star systems should be plentiful in space, and in reality they are. Over 75 percent of all stars in the universe are part of a multiple star system. So it would seem sensible to consider the question of whether a stable planetary system can exist in a system of multiple stars. Dr Robert Harrington of the U.S. Naval Observatory, Washington DC, USA, conducted a computer study on the stability of planetary orbits in and around a binary system. According to his results, he says that the orbit of planets in a binary system could be very stable indeed. He points out that if our Sun was replaced by two stars only 0.4 astronomical units apart, each having only half the mass of the Sun, with an orbit eccentricity of 0.5, the orbit of Earth and all the outer planets would be unchanged. As for the two inner planets: Venus would have changed its orbit only slightly, while Mercury found the condition two difficult to cope and rapidly spun-out of the solar system. Similarly, if a star replaced Jupiter with identical physical characteristics as our Sun, then the inner planets except Mars would remain stable in their respective orbits. And now we have found clear and irrefutable evidence of a planet within a triple star system. On 14 July 2005, Maciej Konacki, a senior postdoctoral scholar at the California Institute of Technology announced in a paper published in the Nature journal the discovery of the latest Jupiter-sized extrasolar planet. What makes this one unique is the number of stars this planet lies in: three in total. The star system, known as HD 188753, is located 149 light years away in the Cygnus constellation. The planet revolves around one of the stars (a yellowish Sun-like star) at a very close distance taking only about 3.5 days to revolve around its parent star. Remarkably this planet is able to survive in its current orbit for billions of years despite the gravitational pull of the other stars. The distance to the other two stars (a medium-sized orange star and a smaller red star) is said to be equivalent to the distance between the Sun and Saturn. In conclusion, this observation tells us we should not ignore the possibility of biological life emerging in a system of multiple stars. In that case, where exactly in our Milky Way should we find the highest concentrations of ETs? Can we find them lurking near the centre of the galaxy where the highest concentrations of stars exist or further out? According to the work of Dr Charles Lineweaver of the University of NSW in Sydney and his colleagues Yeshe Fenner and Brad Gibson of Swinburne University of Technology, Melbourne, Australia, the ETs should live in the "habitable zone" which, for our own Milky Way, lies between 20,000 and 30,000 light years from the centre of the galaxy. The habitable zone is where the galaxy gravitationally attracts the right soup of elements for life and a technology. Any closer to the centre of the galaxy and civilizations may have a lot of metals (and other elements), but stars and planets will be bigger and many of the stars are more likely to experience supernova explosions very early in life, making it very hard for newly-formed life to establish itself on an unseen planet. Likewise, the further away a sun-like star is from the centre of the galaxy, the less chances of attracting enough of the right chemical building blocks for creating life including carbon, oxygen and nitrogen as well as the metals required for building a technology. Therefore the best place to create life and develop a sufficiently advanced technology with metals has to be in the so-called "habitable zone". This means approximately 10 percent of all stars in the Milky Way are in the habitable zone according to Lineweaver. We are still talking about millions of single sun-like metal-rich stars including our Sun in the habitable zone of the Milky Way considered suitable to the evolution of life and the development of a technologically-advanced civilization. Furthermore, the zone is said to be expanding at a rate of approximately 3,000 light years every billion years, meaning more stars could harbour ETs both biologically and technologically speaking. Bova & Preiss 1990, p.118 (Plate 2). The idea of the life zone was first studied by Dr Su-Shu Huang, a Chinese expatriate who obtained his doctorate at the University of Chicago. Couper & Henbest 1992, p.45 (Table); Ashpole 1989, pp.54 & 88.